We inspect and test all heat pipes. Each heat pipe is stamped with a serial number and is presented with a quality certificate displaying the startup curves from ambient and the temperature differential between the middle adiabatic (transition) section and the condensing (sinking) end at a programmed working temperature considered representative (usually in the interval 50…90⁰C). The analytic appearance of the startup curves is presented in Figure 1.1. Symbolic to our thermosyphon heat pipes is the near equal isothermal temperatures as depicted in Figure 1.2. Indicative to thermosyphon heat pipes, is the phase change start-up represented by the “saw tooth hills” in the start-up curve. 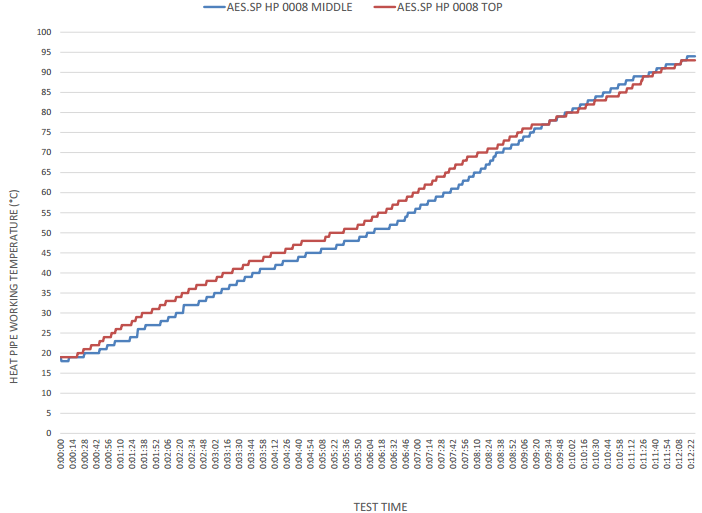 The estimated testing time for obtaining representative startup curves for up to four heat pipes per inspection is approximately 5…10 minutes. The client will be provided a copy of the quality certificates consisting of Excel files showing four (4) diagrams each. See figure 1.2. 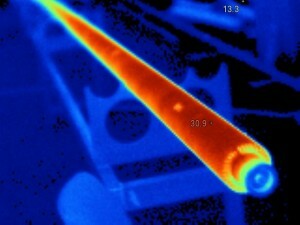 With a thermographic image, it is evident to see the isothermal properties of a Heat Pipe.